(Nanowerk News) Researchers have developed a fast and practical molecular-scale imaging technique that could let scientists view never-before-seen dynamics of biological processes involved in neurodegenerative diseases such as Alzheimer's disease and multiple sclerosis. 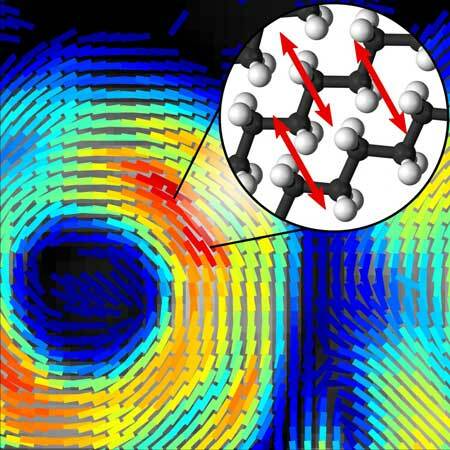 The new technique reveals a sample's chemical makeup as well as the orientation of molecules making up that sample, information that can be used to understand how molecules are behaving. What's more, it acquires this information in mere seconds, significantly faster than the minutes required by other techniques. The faster speed means it will be possible for the first time to watch disease progression in living animal models at the molecular level. With further development, the technique might also be used to detect early signs of neurodegenerative diseases in people. In Optica("High speed polarization resolved coherent Raman scattering imaging"), researchers led by Sophie Brasselet of the Institut Fresnel, CNRS, Aix Marseille Université, France, report their new technique, called high-speed polarization resolved coherent Raman scattering imaging. They used artificial lipid membranes to demonstrate the technique's capabilities for enhancing neurological research. The artificial membranes used in the study are made of packed layers of lipids that are similar to those found in the myelin sheath that covers axons to help electrical impulses move quickly and efficiently. When diseases such as Alzheimer's and multiple sclerosis progress, these lipids start to disorganize and the lipid layers lose their adhesion. This ultimately causes the myelin sheath to detach from the axon and leads to malfunctioning neural signals. "We designed a technique able to image molecular organization in cells and tissues that can ultimately let us see the early stage of this detachment and how lipids are organized within this myelin sheath," said Brasselet. "This could help us understand the progression of diseases by identifying the stage at which lipids start disorganizing, for example, and what molecular changes are occurring during this time. This could allow new targeted drug treatments that work differently than those used now." The new technique developed by Brasselet and her research team makes use of a nonlinear effect called coherent Raman scattering that occurs when light interacts with molecules. The frequency, or wavelength, of the nonlinear signal provides the chemical makeup of a sample based on its molecular vibrations, without the need to add any additional fluorescent labels or chemicals. The researchers built on an existing approach called stimulated Raman scattering imaging, which enhances the Raman signal by modulating the laser light's intensity, or power. To obtain molecular orientation information from the coherent Raman signal, the researchers used an electro-optical device called a Pockels cell to quickly modulate the laser's polarization rather than its intensity. "We took the concept of intensity modulation used for stimulated Raman scattering and transposed it to polarization modulation using an off-the-shelf device," said Brasselet. "The signal detection for our technique is very similar to what is done with stimulated Raman scattering, except that instead of detecting only the intensity of the light, we detect polarization information that tells us if molecules are highly oriented or totally disorganized." The key, however, is to acquire orientation information fast enough to capture highly dynamic biological processes on a molecular level. Previous methods were slow because they acquired an image, then the polarization information, and then repeated the process to capture changes over time. By modulating the laser polarization very fast, the researchers could take measurements pixel by pixel, in real time. With the new approach, it takes less than a second to acquire lipid orientation information in a large image that contains several cells. This information is then used to construct a sequence of "lipid order" images that shows molecular orientation dynamics at subsecond time scales. The researchers showed that their technique could reveal deformation and lipid organization in artificial lipid membranes resembling the packed membranes of myelin. The technique was even sensitive enough to measure the organization of lipids around red blood cells, which have only a single lipid membrane. "Even though we only demonstrated the technique with model membranes and single cells, this technique is translatable to biological tissue," said Brasselet. "It will show us how molecules behave, information that is not available from the micron-scale morphological images taken with traditional microscopy techniques." Brasselet said that the new technique could be used in the near future to better understand progression in diseases that involve a breakdown of the myelin sheath, such as Alzheimer's and multiple sclerosis. For example, it could be used to image neurons in living mice by combining the Raman scattering technique with existing methods in which tiny windows are implanted in the brains and spinal cords of laboratory animals. "Ultimately, we would like to develop coherent Raman imaging so that it could be used in the body to detect diseases in their early stages," said Brasselet. "To do this, the technique would have to be adapted to work with endoscopes or other tools in development that allow light-based imaging inside the body."